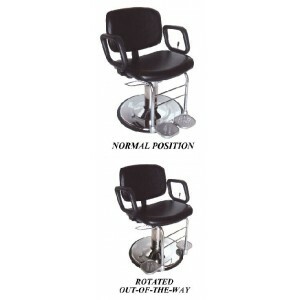 Access All Purpose Styling Chair The Patent Pending ACCESS Chair has a unique footrest that is split into two halves and joined such that both halves easily rotate to the sides of the chair ... and out of the way. This "rotated-out-of-the-way footrest" makes for a safer entry and exit for people who need this advantage; the typical footest is an encumbrance to many. As an additional ACCESS feature, the arm of the chair is removable to permit a person to gain entry to the chair from the side. This would permit a person to be easily helped into the chair from the side; the arm can then be firmly reattached to the chair for safety. Some assembly required.